ESCANABA — Maureen A. Bintner, 89, of 1219 N. 18th St., Escanaba, passed away Monday morning, Dec. 3, 2018 at OSF St. Francis Hospital in Escanaba surrounded by her loving family. She was born on July 10, 1929 in Detroit, Mich., the daughter of Charles and Gladys (McNamara) Parker, Sr. Maureen moved to Escanaba in 1951 and was employed at her father’s tavern, The Metropolitan Bar, where she met her future husband. The former Maureen Parker married Robert Bintner on June 2, 1956 at St. Patrick’s Catholic Church in Escanaba and he preceded her in death on Oct. 28, 2018. Together, the couple celebrated 62 years of marriage and raised five children. Maureen was employed by the Nabisco Company in Escanaba as the billing clerk for 12 years from 1974 until her retirement in 1986. She loved spending time with her family and making memories, especially up at their camp, “The North Y.” She was an avid reader, enjoyed crocheting and playing cards – poker was her game. 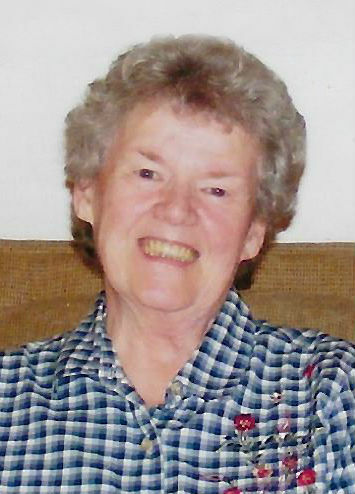 Maureen was a member of St. Thomas the Apostle Catholic Church. She was so proud of her children and grandchildren and will be deeply missed by all who knew her. Maureen is survived by children, Bruce (Cindy) Bintner of Escanaba, Patty (Tom) Bruce of Escanaba, Linda Olson (Mike Waldsmith) of Bark River, Barb (Don) Kwarciany of Milton, Wis., and Dan Bintner of Escanaba; 13 grandchildren, Nicole Potokar, Lisa Knuth, Craig Bruce, Emily Bruce, Mark Bruce, Sarah Olson, Jennifer Olson, Drew Kwarciany, Nick Kwarciany, Eric Kwarciany, Taylor Bintner, Kelly Bintner, and Rachel Bintner; 10 great-grandchildren; and several nieces and nephews. In addition to her parents and husband, Robert, Maureen was preceded in death by daughter-in-law, Rennie Bintner; grandsons, Bobby and Josh Bintner; brother, Charles Parker, Jr.; step-sister, Jeannine Haasch; and step-mother, Patricia Parker. Private family visitation and funeral services will be held at the Anderson Funeral Home in Escanaba with Father Rick Courier of St. Thomas the Apostle Catholic Church officiating. Burial will take place in Lakeview Cemetery in Escanaba. The Anderson Funeral Homes are assisting the Bintner family and online condolences can be sent at www.andersonfuneralhomes.net.